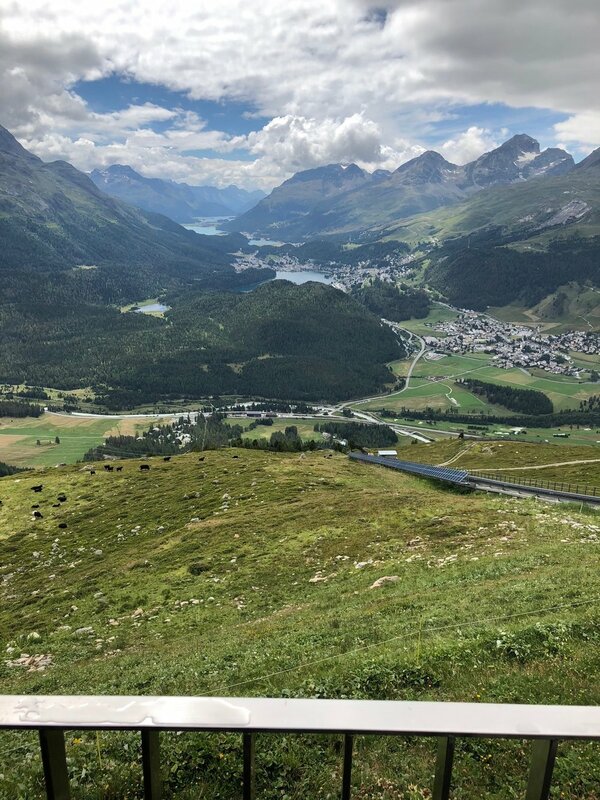 If you been following along Deon and I are just embarking on our 2 week tour of the beautiful country of Switzerland and no tour would be complete with out visiting St Moritz. The train station just the same as the last in Zurich is state of the art and clean, we’d already called ahead to schedule a pick from our hotel called the Hauser St Moritz. While waiting we sat in the train stations convienient store and to my surprise I hear what sounds like Italian but before I couldn’t ear hustle anymore our hotel van pulls up and the look on the drivers face ensured me that we had indeed not packed light enough but at this point we rolling with what we got. I’ll post pics of our luggage in this post so you too can get a good laugh at how Deon and I were strolling through Europe. For now lets get into the hottest at least that’s what we’ve been told vacation spot in the winter of all of Switzerland St. Moritz, we had the pleasure of staying in Hotel Hauser the location of the hotel was perfect it wasn’t too far from all the different must see’s like the lake, train station, food and shopping. We had the pleasure in staying on 1 of the 51 newly renovated rooms, Our Double Comfort Room housed two beds, a window view, full bathroom, desk area and all of our bedding was furbished with Moon Wood. I’ll explain later in the post. Upon our arrival it was unfortunately raining all the lake activities we’d had planned got cancelled, we decided to get situated in our room and get our clothes together for the next day because rain was again in the forecast. The higher elevation definitely made a difference in weather it was also a lot colder than in Zurich our first city we’d visited. The smell of the room was very Alpiney which is not a word but you know what I mean very woodsy. I loved it! In our room literature we leathered that all the furniture and even the inner pillow materials were made of moon wood. After settling in we set out to walk and discover since the remainder of the day was for leisure, the travel company we used to book the trip did an excellent job of giving us rest time or leisure time on the days of travel. 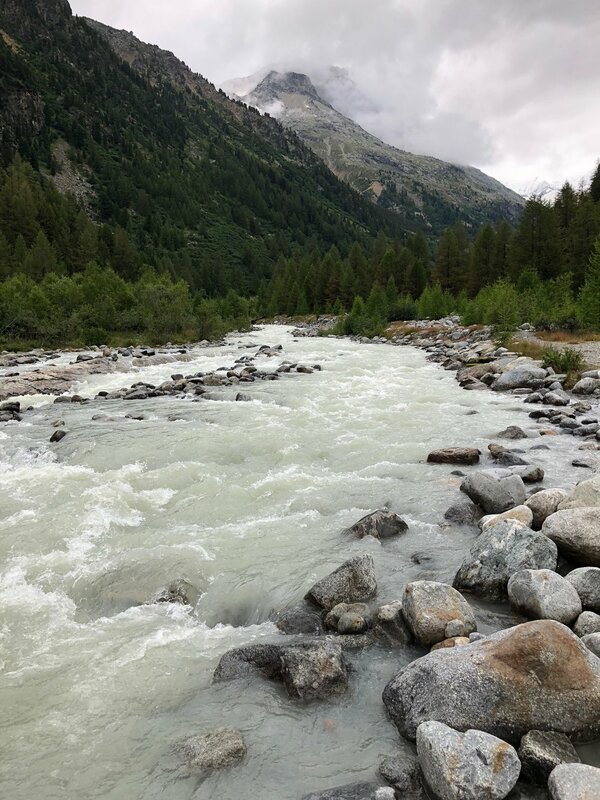 The gorgeous lake is what we saw arriving to the train station, as well as, through our window at hotel Hauser which is why it was our first thought was since we can do any water activities lets take a stroll around! We ended the evening with room service, hot showers and sleep! Our alarms were set for 5 AM……. 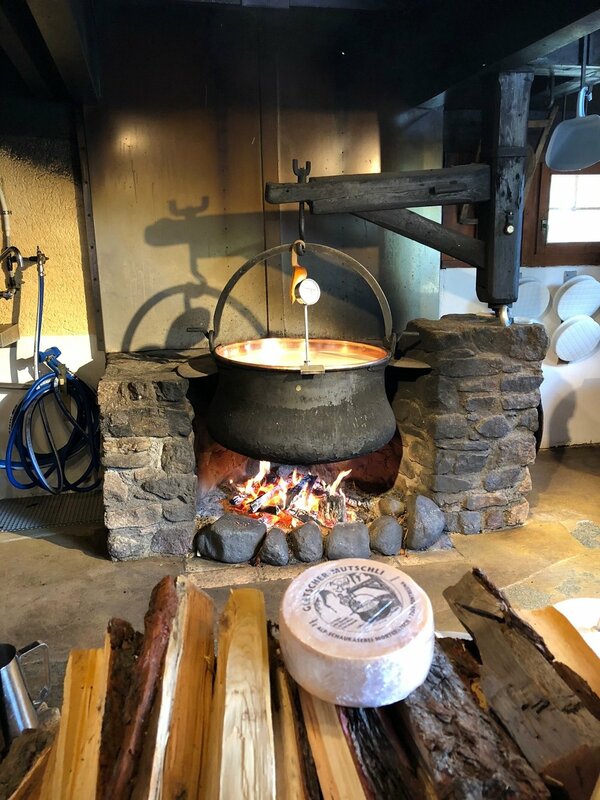 If you watched “Lights, Camera Switzerland then you already know about the Alpine Cheese Dairy experience! Deon and I had the pleasure of not only eating cheese but making cheese yes making cheese it was a wonderful experience and one of the highlights of our trip. We also took a funicular ride up tp Muottas Muragl were we were able to look out over the gorgeous Engadine Valley. The last photo above was the view from our bus stop that we used to catch the bus from Muottas Mugarl back to our hotel. It is currently the screen saver on my Mac, I know Ive said this a few times already but I cannot begin to express just how beautiful the entire country of Switzerland is. 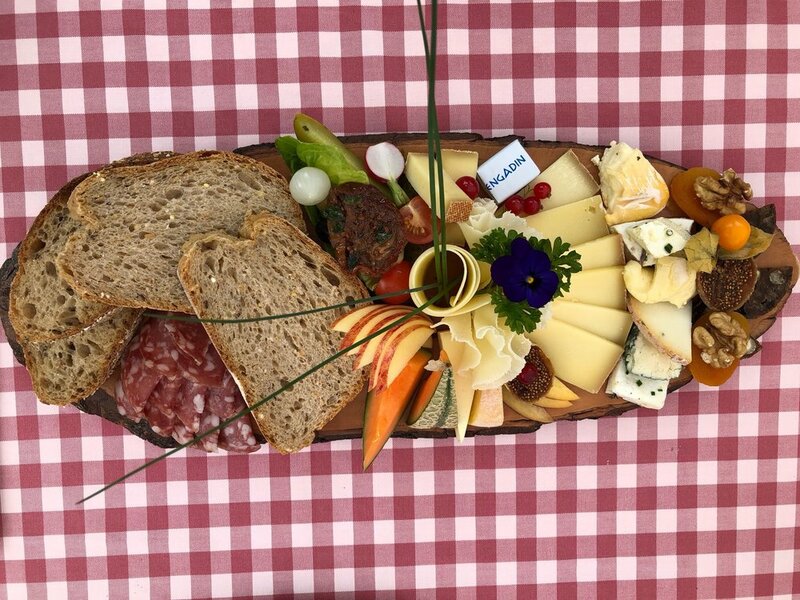 After arriving back from a long morning and afternoon of adventure we were starving, the delicious cheese platter had held us all morning long it was filling and mouth watering I’m getting hungry just thinking about it now. On Muottas Mugarl we enjoyed the view and a cocktail although the food there also looked great! Once back at the hotel we had a late lunch at the restaurant on site went over the next days itinerary and headed back to our room the moon wood took over we had a longer than average well needed nap. Now I know you’re gonna say hey I thought you said in your previous post you guys weren’t eating at the hotels and you’re right we did. But, St Moritz is the hottest winter resort in Switzerland and we were there in the thick of the summer several hotels, restaurants and even shopping stores were closed with an “Open for winter” sign so our choices were limited. However, Deon and I like to consider our selves fun and easy going so nothing was going to stop us from having fun! After our nap we headed out for an evening walk for beer and pizza we were both super excited for the next day which was our day of travel to Andermatt via the Glacier Express!